When he was an undergraduate at Wayne State University in Detroit in the mid-1980s, Keith Ellison authored a news article that questioned the motives of a journalist for breaking the news of Jesse Jackson calling Jews "Hymies," and saying New York City was "Hymietown." The report dates back to 1984 when Ellison covered controversial remarks by then-presidential candidate Jesse Jackson that were originally broken by the Washington Post, and reporter Milton Coleman, who is black. In the second paragraph, Ellison quoted one sentence of remarks by Nation of Islam leader Louis Farrakhan aimed at Coleman, in which Farrakhan said, "One day soon we will punish you with death." 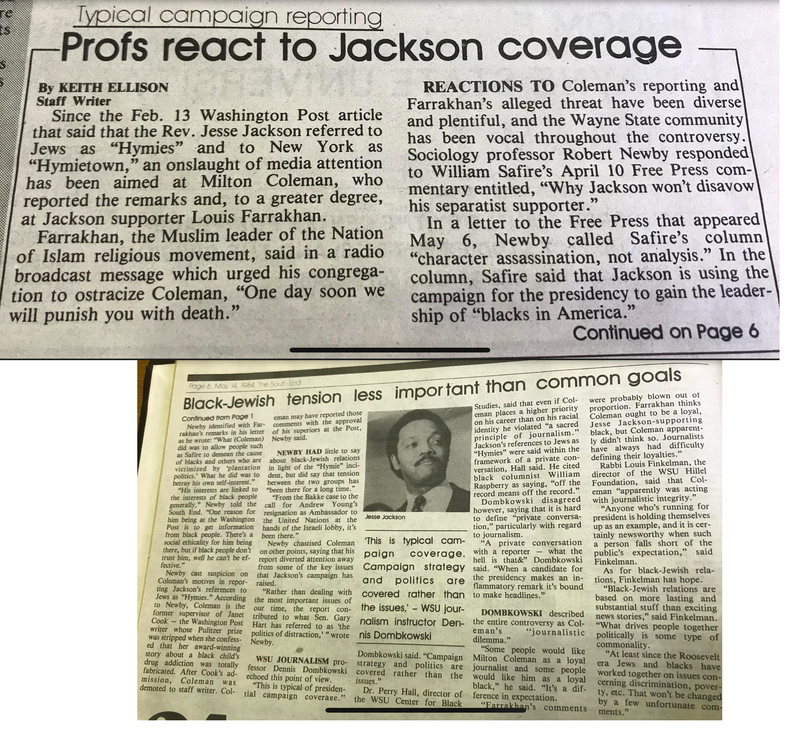 The article went on to use the reactions of a Wayne State professor to question the motives of the Coleman, and whether the black community would continue to trust him after the Jackson report. 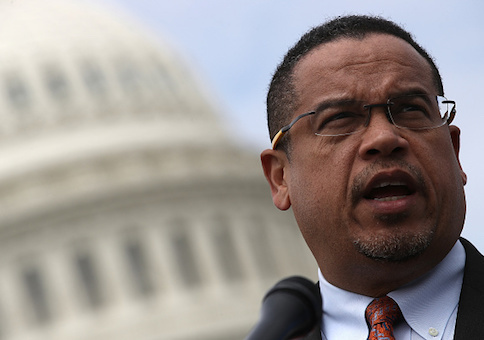 The article represents another connection between Ellison and Farrakhan's ideas. After controversy arose in 2006 during his original run for Congress surrounding Ellison's relationship to the Nation of Islam leader, Ellison wrote a letter in May of that year to the Jewish Community Relations Council in Minneapolis, trying to distance himself from Farrakhan. Ellison "apologized for failing to ‘adequately scrutinize the positions' of Farrakhan and other Nation of Islam leaders," according to the Washington Post. "They were and are anti-Semitic, and I should have come to that conclusion earlier than I did," Ellison wrote to the Jewish council. When Ellison won his 2006 race, he became the first Muslim to ever serve in Congress. Questions about his flirtations with Black Nationalism and his relationship to Farrakhan rose again in 2016 when he sought the chairmanship of the Democratic National Committee. And questions have persisted to this day, such as in June of this year, when Ellison was pressed on his past with Farrakhan by CNN's Jake Tapper. 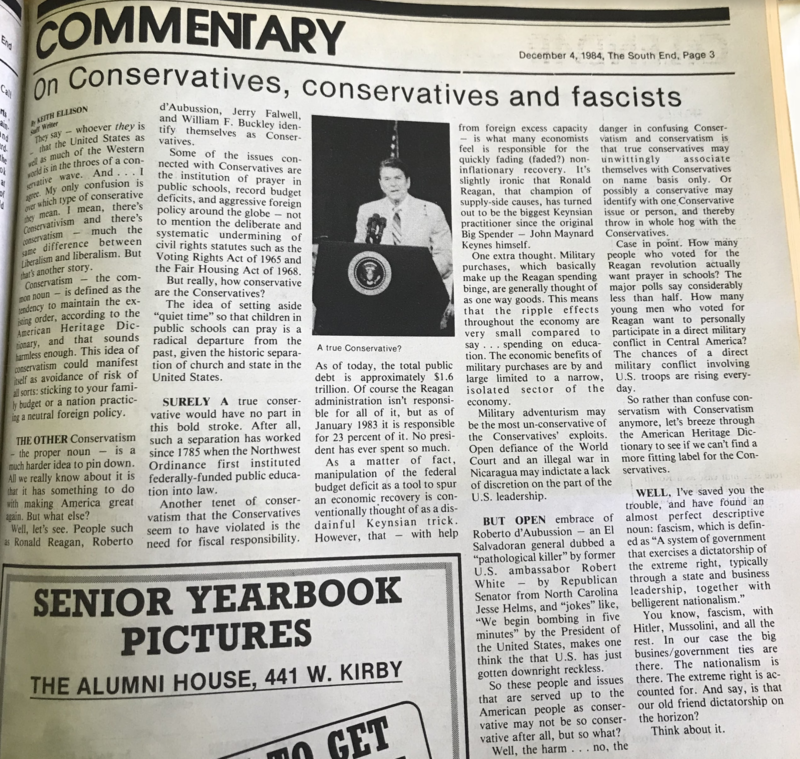 In another article from his Wayne State days, Ellison penned an editorial on conservatism shortly after President Reagan's reelection in 1984, titled, "On Conservatives, conservatives and fascists." So rather than confuse conservatism with Conservatism anymore, let's breeze through the American Heritage Dictionary to see if we can't find a more fitting label for Conservatives. Well, I've saved you the trouble, and have found an almost perfect descriptive noun: fascism, which is defined as "A system of government that exercises a dictatorship of the extreme right, typically through a state and business leadership, together with belligerent nationalism. You know, fascism, with Hitler and Mussolini, and all the rest. In our case, the big business/government ties are there. The nationalism is there. The extreme right is accounted for. And say, is that our old friend dictatorship on the horizon? The Washington Free Beacon also obtained a copy of a cartoon drawn by Ellison, which drew a firestorm of controversy and local media coverage when it happened, but was again reported on by Mother Jones in 2017. 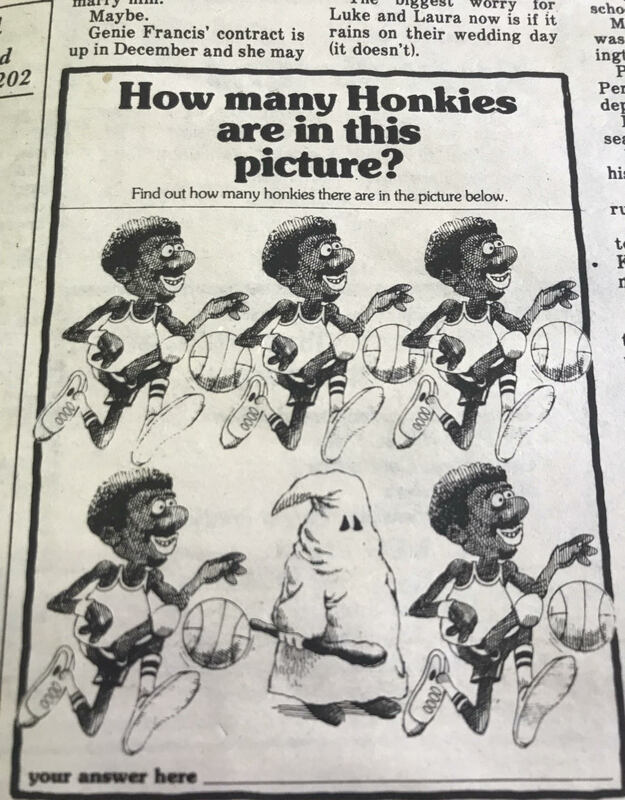 The drawing shows five black men dribbling basketballs, and one person in a Ku Klux Klan robe and hood and clutching a club. The caption above the drawing says, "How many honkies are in this picture?" "It was meant to poke fun at racial caricatures, but students didn't see the humor," the Mother Jones article said. "An African American classmate stormed into the newspaper's office to confront him—a scene Ellison breezily recounted in a follow-up column mocking the outcry." Ellison wrote for the student newspaper The South End while an undergraduate at Wayne State in the mid-1980s and then later attended the University of Minnesota to study law, where his writings under the name Keith E. Hakim became a source of political controversy. Ellison is currently running for attorney general of Minnesota. A request for comment to the Ellison campaign was not returned. This entry was posted in Politics and tagged 2018 Election, Keith Ellison. Bookmark the permalink.